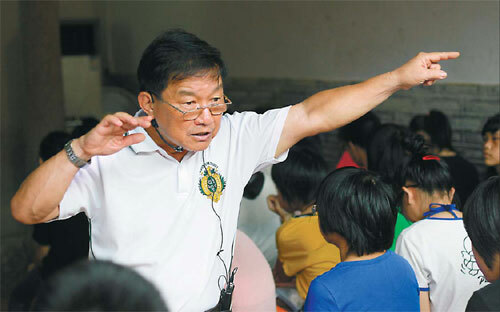 David Liao teaches students at the English tuition center, which was formerly his grandfather's ancestral hall. Liao's reputation has spread quickly and students of surrounding villages are keen to attend his classes. There is a rural village in Guangdong where even a 4-year-old can fluently respond to an English greeting. And as Xu Jingxi discovers, it's all thanks to the efforts of a retired Chinese-Malaysian. When David Liao turned up in Changjiao village 10 years ago and announced that he would teach the children how to speak English for free, the villagers in this tiny hamlet in Meizhou, Guangdong province, all thought he was just a "mad foreigner". Liao, now 67, spoke only English and a smattering of Mandarin, and the people in this mountain community were puzzled by his attention, and intentions. "We couldn't figure out why he chose to come to our remote village to teach English. And as a man who was almost 60 at that time, he was still single. How strange!" villager Chen Cuixiang recalls. But Liao was no stranger, as they thought. "I was born in Malaysia but Changjiao village is my ancestral home. I decided to come back to help the village after I retired as an English teacher and a high school principal in Malaysia," he explains. He had visited Changjiao village twice before, in 1996 and 2001. "The village was an abandoned, dying village, with only old people doing a little farming work. The young people were all going to the cities to earn money. There were only mud and gravel roads," Liao's first impressions of his ancestral village were dismal. "The village head complained that it was difficult to find an affordable English teacher who would agree to come to the mountain village to work," Liao recalls. He thought about it and decided to volunteer for the job. It was not easy-going, and Liao found his intentions questioned. Villagers were suspicious and students played tricks on him - puncturing his bicycle tires and stealing his laptop. Instead of getting discouraged, Liao decided to work at it, studying the local Hakka dialect so he could communicate better. After classes, he would ride to tutor two private students, one-on-one. He had one student in the village and the other in Dabu county about 7 km away. "No matter what you do, there is always someone who supports you, someone who is against you and another who would wait and see. I must do it well even if there is only one in a hundred who supports me," Liao says. It was this commitment that started to change the general perception. Liao Luhong was one of Liao's first private students. The 21-year-old college student was in his fourth year of primary school when his grandfather invited David Liao to be his English tutor, during the summer holidays. The little boy could not even recite his alphabet then. "My grandson got transferred to a primary school in Shenzhen. He scored only 30 points in his first English test. It was not surprising because kids in our village are not taught English until they are in the fifth grade," says his grandfather Liao Xuming. The mad foreigner's tuition proved to be very effective. In his fifth year, Liao Luhong came out top of his English class and two years ago, he was admitted to college, helped by his high scores in English. "My spoken English is better than many of my college mates, although many of them are from big cities," says Liao Luhong. David Liao's teaching skills have quickly spread by word of mouth, and more and more people from the surrounding country and cities heard of this experienced teacher with nearly 45 years of English teaching under his belt. The media has also helped spread his reputation to as far away as Guangzhou, Shenzhen and Huizhou. There are now many parents eager to send their children to his classes during weekends and school holidays. In their eyes, Liao's classes offer their children a chance at a better future. "Because of the lack of qualified English teachers, kids in rural areas lag far behind their peers in urban areas in terms of English proficiency. It is often the subject where the biggest gap in scores lies," Liao says. Since Liao started teaching English in Changjiao, more than 20 young people from the village have gained admission to college. Before that, there were very few. Liao also sponsored those college students who had difficulty paying tuition, and the subsidies ranged from 3,000 yuan ($472) to 10,000 yuan per year per student. But he has also been plagued by the principles of diminishing returns. There are now too many students for him to handle. "I never thought of gaining fame with teaching. Some parents also think I can improve their children's English with just a weekend course, or a week of lessons. "Also, I believe in quality education. The number of students in a class shouldn't be too big," Liao adds. "I want to invest my limited energy and resources on students who really need my help and are eager for that help." For that reason, he has no hesitation kicking out students who are disinterested or inattentive, even if the child is the son of an important official. He interviews each prospective student and only accepts those who are genuinely interested, and not just forced by their parents to attend classes. Liao has had to expand his physical classroom, turning a dilapidated ancestral hall built by his grandfather into an English tuition center that can accommodate about 200 students. But, there is hardly room for proper desks, and students have to perch on plastic stools. A projector and a set of acoustic equipment ensures students can hear and see the teaching materials Liao uses. Bookcases line the hall, and are filled with original English editions. Rooms in the wings have been turned into dormitories for students living far away and the dozens of volunteers who help with summer and winter courses. Liao paid for all the renovations and maintenance costs of running the English center and his generosity sounded "unbelievable" to many. Liao Huiru, David Liao's former assistant, remembers a mother's reaction about her daughter telling her she was going to take free English lessons in a mountainous village. "She couldn't believe there could be such a good Samaritan and a capable English teacher in a village. She thought her daughter was falling into the trap of a pyramid scheme gang." David Liao not only established the English tuition center, he also funded the building of the cement road leading into the village, set up street lamps, bought nearly 10,000 pomelo saplings for an orchard and established a pig farm for villagers. "My father passed away when I was 13 years old. A kind-hearted principal sponsored my education. I decided that I would also help people in need when I grew up. My father's sudden death made me realize life could be fragile. He passed away in his sleep without any warning, right beside me in the bed. "I should live every day to the full. For me, it means devoting myself to helping people." Liao says he did not get married because he couldn't have done his charity work if he had a family to look after. "I don't feel lonely. I have more children and grandchildren than any one - they are my students," says Liao, who has been giving English lessons for free in poor communities in his spare time since he started teaching in Malaysia in 1968. He says he is able to continue with his volunteer efforts thanks to many of his previous students who have come back to offer their support, either with donations or other helps. It is this spirit of giving that is even more important than the English lessons, he says, and he hopes now his students in the village can also pay it forward. 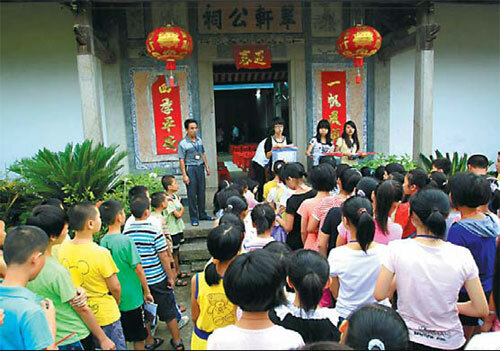 In fact, his efforts have shown fruit - Changjiao village is now known as the "English" village where even the young children you meet on the streets can greet visitors with a, "Good morning" and, "How do you do", in English. Villagers who used to quarrel over trivialities have been moved by David Liao's generous spirit, and they have learned to help each other. "I may leave the village five years later," says Liao. "The English learning center doesn't belong to me. It belongs to the village and I'm confident that they will maintain it with the farming projects I helped establish. And my students will be the new teachers." Contact the writer at xujingxi@chinadaily.com.cn.